The centerpiece and title work of the show is Trinket (2008/2015), a monumental installation consisting of a custom-made 54 x 16 foot American flag. 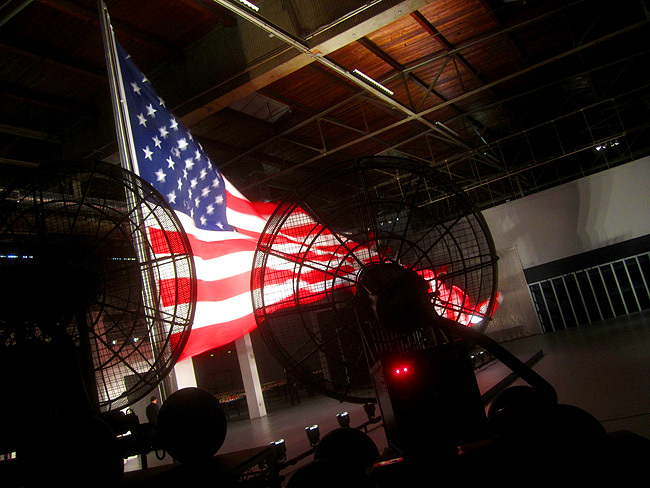 During the museum’s public hours, the flag is blown continuously by four industrial-grade special effects fans—the type that are used on film sets to simulate rain storms. Over time the forced air will cause the whipping flag to fray, its stripes becoming an unpredictable hydra. Trinket was first realized in 2008, in a moment rived by war, appeals to “enduring freedom,” and news of torture. Today, against discrepancies of justice in Ferguson, New York, and elsewhere, the work issues a potent metaphor for the challenge and change democracy must endure if it is to prove its resilience.